John Collins shares his enthusiasm for cool water diving with this book of 120 exquisite photographs. He captures the extraordinary colour, form and diversity of life in temperate waters, and inspires you to get your kit and visit the dive sites illustrated. A coffee-table format book, each chapter starts with a beautifully written essay extolling his dive areas and underwater encounters. The photos are interspersed with quotes from diving pioneers, authors and naturalists like Jaques Cousteau, Rachel Carson and Philippe Tailliez. Collins portrays subjects from jellyfish to great white sharks as well as some beautifully composed marinescapes with fish-tank clarity. A couple of things I would have liked in the book are an index of places and things photographed, and Latin names for the animals shown. However, the common name of the animal and its location are given. John Collins is lives in Kinsale on Ireland’s south coast with his wife and two daughters where they operate a family-run pharmacy. A passionate photographer from his teens, he started diving at college in Dublin and was immediately was keen to photograph the underwater world. Many of his photos have been successful in competitions and widely published. John Collins is a graduate of the New York Institute of Photography. 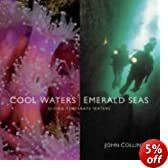 Cool Waters, Emerald Seas: Diving in Temperate Waters is available from amazon.co.uk or signed copies from the author’s web site at http://www.johncollinskinsale.com/.